Last year, J.C. Chandor made a splash (sorry) with All is Lost, a movie that followed Robert Redford across the ocean as the lone yachtsmen struggled to stay alive during a storm. Its scope was small, but its ambition was huge--a situation that is reversed for Chandor's follow-up, the dreary A Most Violent Year. The writer/director is working on a larger canvas with a talented ensemble cast, but his goal appears to be little more than aping his forebears. 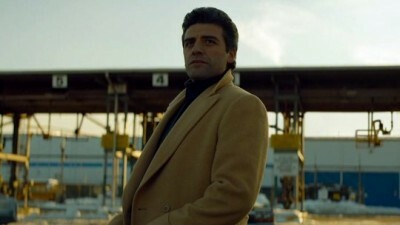 Set in 1981, A Most Violent Year stars Oscar Isaac (Inside LLewyn Davis) as Abel Morales, a self-made business man who pulled himself up from the New York streets to achieve the American Dream and now runs his own heating oil wholesaler. Though "self-made" is questionable. He married a gangster's daughter, Anna (Jessica Chastain, Interstellar), and as much as he doesn't like to admit it, may have gotten a clandestine helping hand here and there. In fact, Abel's biggest problem is he tries to deny that he's part of a corrupt world. His competitors in the fuel business, all of whom are mobbed up, have been hijacking his trucks, and the district attorney (David Oyelowo, Selma) is leading an extensive investigation into the racket, with much of his attention being paid to Abel. All of this is going down as Abel is trying to close a deal on a piece of property that will expand his business. The more trouble these sticky situations causes, the harder it's going to be to cover the cost by honest means. Chandor is essentially making a "gangster trying to go legitimate" picture but he's skipping right over the standard gangster part and takes us straight into the numbers game of cooked books and backroom handshakes. That's his lone wrinkle on the material. Abel does what is "most right," and avoids violence and short cuts at every turn. His wife wants him to call her father for help, and Abel's rivals and other business relations continually open and close the door on the possibility of him crossing to the dark side. Meanwhile, Abel tries to lend a helping hand to an immigrant driver (Elyes Gabel from TV's Scorpion) who himself can't seem to stay out of the muck. After being beaten during one of the robberies, Julian goes on his next job with a pistol by his side, putting him on the wrong side of the law when the hijackers come again. The Julian story line at least has some resolution, even if it is a cheesy and obvious one. Chandor is trying to unspool a lot of threads here, and some of them get away from him. For instance, do we also need the parallel example of a young salesman who gets roughed up out on a call? What about the young banker (Christopher Abbot, Girls) who raises Abel's ire, never to be seen again? Chandor seems so focused on building a criminal underworld that would compete with Scorsese and Coppola he somehow forgets that all the pieces matter. He also misses the fundamental promise of his own title. If you're going to call your movie A Most Violent Year, the audience is going to expect a little blood. Even if you're not going to shed it, you should at least make it boil. The plot of A Most Violent Year is more about pushing paper than it is pushing people around, grand statements about ethics over expressed threats. There seems to be a zeitgeist right now where filmmakers telling stories about scandal and carnage feel it's better to place themselves above the sordid material than indulge in it. Be it the snobbish intellectualism of Foxcatcher or the miscalculated dourness of Mockingjay, Hollywood has adopted a po-faced demeanor for the final months of 2014. 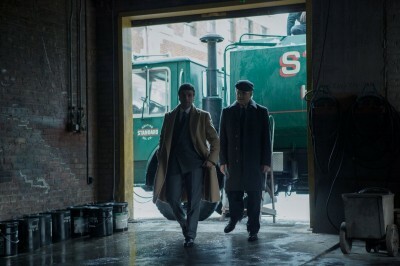 Chandor's film is little more than a high-minded game of dress-up, with Oscar Isaac proving a dependable clotheshorse, but with the subtlety of a Clydesdale shilling beer. His Michael Corleone impression has all the external trappings of an internal conflict, but none of the soul. The gestures are there, the posture, the measured delivery of each line, even the hair--but there's no feeling. Which is basically Chandor's problem throughout the movie. He's getting all the details right, but he might as well be building it out of Lego it's so rigid, so self-serious, so plastic. To be honest, I couldn't help but think of American Hustle, last year's bad clothes and bad hair period piece, which turned into one of the more divisive awards-season releases. Say what you will about David O'Russell's cops and con men picture, but at least it had a tongue in its cheek. Its characters knew how to smile and did what they did to try to find the sun through the rainclouds. They were interesting to watch. Not so much here. To be fair, Jessica Chastain manages to find some of the conflict that Isaac cannot, playing the dutiful wife and mother who harbors a mafia princess just under the surface. And Albert Brooks is predictably excellent as Isaac's beleaguered counsel, a mob lawyer deprived of his bag of tricks by a boss who won't play along. Cinematographer Bradford Young also brings the same kind of cool to A Most Violent Year as he did Ain't Them Bodies Saints, capturing the icy pallor of New York as fall turns to winter. They can't really save A Most Violent Year. The pacing is too rigid, the plotting too restrained, and the resolution too contrived. J.C. Chandor is his own worst enemy here, seemingly confounded by the film's message--or perhaps too beholden to it--and unable to play dirty when it's required. Order "A Most Violent Year" now!